Though the premise of Richard Linklater's tribute to Hal Ashby's The Last Detail may sound like the plot to Last Vegas it is in fact much more than that. Adapting Darryl Ponicsan's novel, Linklater turns a road trip and reunion between three ex-marines into an enjoyably silly and poignant comedy exploring loss of faith and trust in government. Set in December 2003, it captures a particular moment in post 9/11 American history, and is told from the point-of-view of men who have faced conflict head-on and survived. 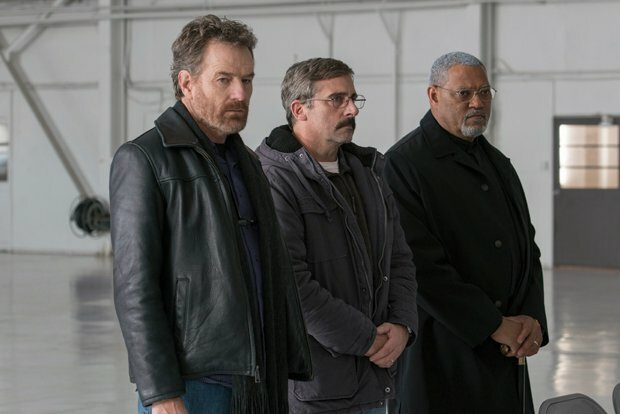 The charismatic trio of Steve Carell, Bryan Cranston and Laurence Fishburne star as Larry, Sal and Mueller respectively. It is Larry who gets the gang back together under sad circumstances for the funeral of his son who was killed in the Iraq war, and Carell's performance is imbued with real pathos. Sal is a semi-functioning alcoholic dive-bar owner and Cranston has lots of fun delivering his rebellious wise-cracks. Fishburne gets the straight man role, as reformed gambler and boozer Mueller who is now serving as a pastor. The radio in Sal's car no longer works so, despite the similarities to Linklater's Boyhood in its theme of the passing of time, the soundtrack doesn't boast a vast collection of songs to reflect the early noughties. It instead features pared-back music, with Linklater using Eminem's 'Without Me' as an anthem of sorts. The screenplay, co-written by Linklater and Ponicsan himself (who also wrote the novel The Last Detail, and worked on the script for Ashby's 1973 film), occasionally falters with plot points that feel contrived, but the sense of brotherhood remains convincing. Though Larry, Sal and Mueller aren't always the wisest of men, Linklater's Christmas-set film about family and responsibility acts as a sincere reflection on the futility of war, with the characters discussing provocative issues in a frank manner. Screening on Sun 8, Mon 9 and Tue 10 Oct as part of the London Film Festival 2017. General release TBC.